A dragon under the effects of Dragonrend is forced to land. Dragonrend is a dragon shout that weakens a dragon and forces it to land. It is said to do so by forcing a dragon to experience mortality, a completely foreign concept to the ageless and immortal dragons. For this very reason, it is impossible for any dragon to learn Dragonrend. 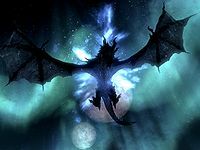 The shout is learned during Alduin's Bane, as part of the main quest, by hearing the three Nordic heroes, Gormlaith Golden-Hilt, Felldir the Old, and Hakon One-Eye, use it against Alduin. In addition to rendering a dragon unable to fly, they will stagger from this Shout even if one Word of Power is used. This makes it additionally useful for "stun-locking" the dragon after it lands, exploiting the quick cool-down compared to other Shouts. The third word of this shout provides a slightly shorter period of time in which a dragon will be grounded relative to the cooldown. The first and second word version provide 1.5 seconds of time in which a dragon will be grounded for each second spent recharging your shout. However, the third word only provides 1.46 seconds of time a dragon will be grounded for each second spent recharging after using the shout. Dragonrend has no effect on NPCs and non-dragon creatures, and will not turn them hostile or cause a bounty. If there is no valid landing location nearby, a dragon will fly away from the player as it looks for a usable landing location, potentially ending the battle by flying far enough away. ?